Looking northwest at Interstate 84 from the Utah 65 (Main Street) over crossing at Exit 115. Photo taken 09/08/05. Interstate 84 enters the state from Idaho at Curlew Valley in Box Elder County. Traveling eastward, the freeway runs between the Hansel and North Hansel Mountains to Rattlesnake Pass and Blue Creek Valley. The rural route encircles the Point Lookout Mountains to the merge with Interstate 15 at Tremonton. 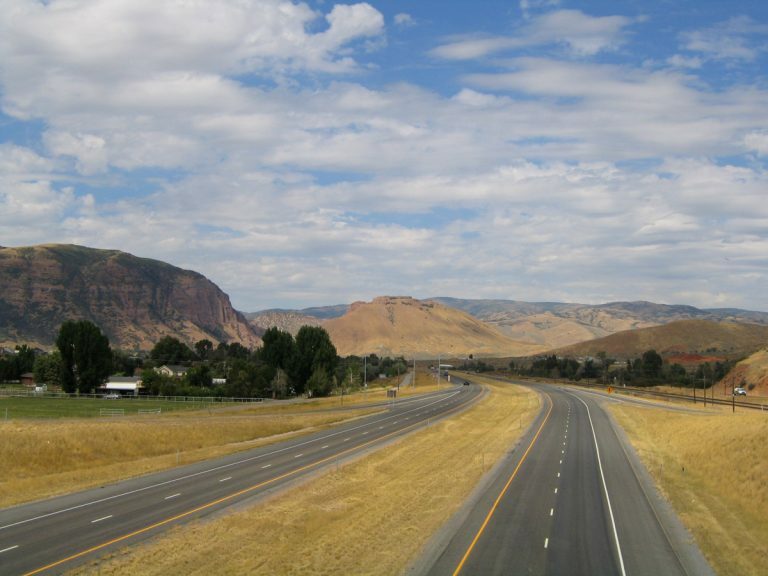 I-84 shares a 35.98 mile concurrency with Interstate 15 southward across Bear River Valley to Brigham City and Ogden. Southeast from I-15, Interstate 84 crosses the Wasatch Range through Weber Canyon, Morgan Valley, Upper Weber Canyon and Henefer Valley to end at Interstate 80 and Echo Junction. "Road numbers to change." The Spokesman-Review, November 3, 1977. "Rough going for interstate." The Deseret News, May 16, 1974. "Officials dedicate the final stretch of I-84." The Deseret News, September 26, 1986.